Orphaned by the brutal death of her mother right before her very eyes, a young Anati child flees into a nightmare of lonely survival, desperate hunger, and fearfully haunted nights. In the very same city, a young, purebred Nephti kit has everything she could ever want - prestigious parents, a noble family house, and a well-appointed lair. These two will become the heroines of their age and legends of the ages to come, but the path that leads them there will be neither easy nor glorious. Vanarra Anasto grows up as an outcast, hiding from society while Sahnassa de Orturu flees from the expectations her parents and family lay upon her. As Vanarra claws her way slowly forward, hoping to survive and find a future, Sahnassa's future is challenged and undermined by the very family sworn to protect and nurture her. When the two meet, necessity pulls them together, but the clash of their different worlds constantly pulls them apart. Although they settle into an uncomfortable friendship, Sahnassa's family begins making overtures of reconciliation towards her. Vanarra feels bitterly betrayed, and the pain and hurt of so many seasons of abuse and neglect from the paws of purebreds causes her to lash out. Emotionally wounded, Sahnassa flees back to her family, wondering if a purebred can ever understand the soul of the mixed blood. Where does Purebred: Soul of the Mixed Blood: The Thurian Saga, Book 5 rank among all the audiobooks you’ve listened to so far? 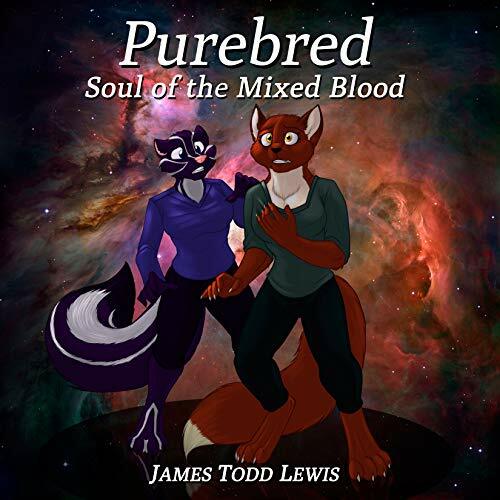 I've heard audiobooks and audio-dramas that include things like ambient sounds, sound effects, and multiple speakers, but that's not the approach taken in 'Purebred'Phillips does an excellent job adjusting herself to the various cast members. Would the story have benefited from someone with a more masculine tone taking some of the male roles? Yes, it would have (especially Flint, who is not only masculine, but VERY masculine, in comparison to others of both his heritages). But given that none are mentioned on the author's site as stepping up to the role, Phillips adapts well enough to the wide spread of different characters and emotional portrayals. So it ranks high in my marks regardless. There are moments where, whether you've read the other volumes in the Thurian Saga or not, you genuinely feel for the characters being portrayed, which is a hard thing for not just an author, but for a voice-actor to pull off.If you have read the other works, it's likely that you'll agree that this volume (being a prequel to the prior works) was a good one to put to voice before the others. It covers backstory, but does so without completely spoiling the plot-points of the books which follow it in chronology, but not release order. It hints at the story's major plot-points to come, but doesn't draw a solid line between anything, so there's still a sense of revelation when stuff comes about. I have two favorite characters in this piece. Not the mains, however.Ashalam, and Flint.I will not give away spoilers in a posted review, of course, but these two resonate not just in emotional appeal, but also in how they effect and influence the main characters of the story (Van and Sahni). Flint, in particular, is a character I'd like to see developed more beyond the books, since he clearly has that potential, and direct connection to Van, who is one of the main cast. Which character – as performed by Elizabeth Phillips – was your favorite? Sahni, read through Phillips' voice, resonated with me much more than Van. Sahni felt more nuanced, developed, and relatable. Phillips' tone and inflection just seemed to lean more towards that character. She did well conveying Van's personality, but not -as- well, at least as far as what I read when reading the book itself as to what the author intended. One character seemed to read as softer, more emotional, but with a bit of a hardened core (Sahni), while the other was more the opposite (easily what the author intended in the text, but not conveyed as best as possible in the narration). *Spoilers for any that read this. Skip this section*Ashalam's passing was very powerful. This was one of the parts of the book where Phillips' voice seemed to fit Van very well, and the emotion conveyed in such an unjust situation was well represented. It was -wrong-, in every sense of the word that anyone who is reviled by the concept of inequality would find it, and Phillips nailed the delivery of that injustice and the harm it imparted on the character suffering through it, and to Van, who had to watch it happen.I do feel Phillips conveyed Sahni best through-out most of the book. But in that chapter, Van not only carried the story, but Philips' voice carried Van through the story just as strongly. Taking place before The Rescue: The First Visitation of Thuria: Thurian Saga, Book 1, Mr. Lewis dives into how Vanassa and Sahnassa ended up at the mountain resort....and how they nearly didn't make it even that far several times. This book alone was probably the most emotional book for me to read, as I could really feel the pains that both Van and Sahni went through, having followed parts of both their lives in my own. Mr. Lewis' delivery of the content was emotional, heartfelt, and makes you smile, cry, and scream. Once I started reading, I couldn't stop until after I finished the book, then I went and re-read The Rescue: The First Visitation of Thuria: Thurian Saga, Book 1 just to get timelines right in my head. I will say that Mr. Lewis managed to get me into introspection and thoughts, his books causing me to face my own history with a new and critical eye for who and what I am...and who all those who bumped in and out of my life along the way are. His books caused me to spend nights thinking and considering, and even remembering and forgiving. Though the whole series affected me, this book and The Fallen: Search for the Path (Thurian Saga Book 6) probably affected me the most, and went beyond just a really, really good read to books that touched my heart and soul. I would say near the top, though my experience with audiobooks is a little light (Full disclosure.) I have heard some of the black library books and a few of the Pendergast novels, and I would say that I had a more enjoyable time with this book than most of the others. In particular the familial/business intrigue and drama during the second half of the book engaged me, and the ending was timed and written perfectly: When it was all over I immediately went shopping for the next book in the timeline. I would have to say Sahnassa gets the nod for my favorite character, more than any character she is in the center of many different arenas during the book and I would guess is playing the most delicate balancing act of all of them through the series. Have you listened to any of Elizabeth Phillips’s other performances before? How does this one compare? I can not compare as I have listened to no other performances, I can only say that in this audiobook I believe she was an amazing choice. Her ability to voice anything from a child to an old woman and everything in between was flawless, and she did well with the male roles as well! If I was simply desperate to make a complaint I might say that even at her deepest, her voice is not what I would associate with an 8 foot tall wall of muscle. This "Criticism" would also apply to most people I have ever encountered, self included. It is not very often that an author manages to really provoke an emotional reaction from me. This one did. Chapter 7, for a variety of reasons was very hard for me to sit through. Before someone confuses this for me dinging the book, the author and voice actress achieved exactly what they wanted to do: I felt sad, I felt hurt, and I felt hate. Well done!